My father loved digging…of all sorts. Digging into the soil to plant things. I wrote about his love of the soil and being able to make anything grow in his special soil in a post entitled Coaxed Back to Life. He also loved digging into the soil to discover hidden treasures of what former generations had left behind. But his favorite type of digging was plunging into the soil of God’s Word to find hidden treasures, those things the ancient generations left for future generations to find. He and my grandfather bought a large farm in the late ’40s and, along with my hubby, began developing it into a community of homes, businesses, and churches in the late ’60s. As the houses were built, Dad found many artifacts. When he and mother decided to rebuild one of the historic homesites on the property, Dad had the students of the archaeology department of the local university to help dig. They found all sorts of shards. Shards of old pottery, bits of colored glass, old marbles, keys. As shards of hearts once living there. What he and the diggers uncovered would have filled a small museum. A lot of it has been given to and preserved by the current owner of the home for a small exhibit in the home. Among Dad’s finds was a large amount of pottery shards in blue and white. Which just happened to be my mother’s favorite colors. She was the blue and white queen! When my mom died a few years ago, one of my sisters and I had to decide what to do with all of mother’s things, which included things belonging to my dad who had died twelve years before. I have a box of some of the blue and white pottery shards. For some reason, the box went undiscovered in our garage. I found it a couple of weeks ago and have been trying to decide what to do with the shards. I’ve seen tables, flower pots, picture frames, mirrors, and other items tiled with pottery shards. I think I’ll do one or all of these things: 1) take one or two of the larger shards and make them into hearts for necklaces, keeping my dad close to my heart, 2) cover a frame for his picture, and/or 3) cover a flower pot or two, since he loved to grow things. I think the flower pot is my favorite: taking shards of one lovely pieces and remaking them into something useful again, filling them with special soil for seeds of beauty to grow. Our heavenly Father can grow anything in the special soil of tender hearts that allow Him to plant His seeds. I want the shards of my heart to be made into something beautiful, to fill it with that special soil and receive those seeds of the Father’s Word and flourish with a harvestful of produce. Today, because of the seed-sowing of my heritage, I am able to stand on God’s promise (below) and hook up with Duane Scott’s blog hop on God’s promises (Mondays). Thank you, Daddy! And thank You, Father! Lynn, your 3 ideas for the pottery shards are excellent and all would be good choices. I enjoyed your thoughts here. Terra, thanks so much for stopping by. So happy to see you. You’ve made my heart happy with your comment. Bless you! Beatiful legacies your father left behind. And memories. And shards of pottery. Very lovely post. Holly, thank you so much for visiting and commenting. I appreciate your kind words. Bless you! 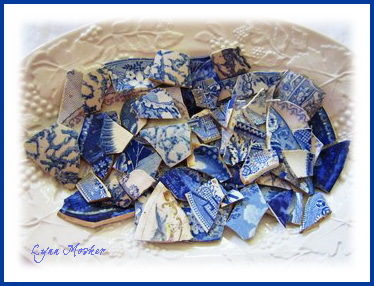 Lynn, please post pictures of what you make from the blue and white shards. Wonderful ideas for keeping your Dad close and celebrating his beautiful legacy of faith! A lovely post to read on Father’s Day! I miss my daddy today. Yes, what Cindee said. Please post pictures. This was such a lovely tribute to your dad. Thank you for linking it up! What a wonderful post, we referenced the same teaching but in very different ways today. Love your idea with the pottery shards. Can’t wait to see photos of it! Bless you, and thank you for sharing your words! LOL Thanks so much, Cindee! I’ll have to think of something to write to go with the flower pot! So sorry, Carol, your dad is no longer here either. Thanks so much for your comment. Bless you! LOL Okey doke, Duane! Will do. Thanks so much for stopping by! Bless you! Hey, Mystic Mom! Haven’t seen you in eons! Hope all is well with you. Thanks so much for stopping by and commenting. Blessings to you!